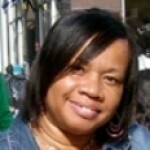 HAPPY PREPOSTEROUS BIRTHDAY TO YOU!! Looking for ideas for a great birthday party? 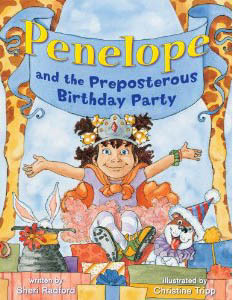 Then be sure to read Penelope and The Preposterous Birthday Party so you’ll know what you shouldn’t do! This very funny book, written by Sheri Radford and chocked full of wonderful illustrations by artist Christine Tripp, is one of the cutest birthday books you’re ever going to read. Adorable little Penelope is having a birthday party, and has permission to invite her closest friends to help celebrate. But Penelope doesn’t want to leave anyone out of the fun, so her house is soon packed with smiling, prancing, bouncing classmates, soccer players, clowns, magicians…and yes, even monkeys! Now that’s a party! One unique twist in this hilarious story is the fact that Penelope’s parents are not the typical couple you’ll see in most picture books. Her mother is African American and her father is white, yet the issue of race is never even addressed. Rather, the illustrations emphasize the normalcy of multiculturalism, and the hilarity of what happens at birthday parties when too many kids are in the house. This is a great book for the beginning independent reader. The illustrations are bright, funny and expertly-sketched,and I love how Radford uses the doorbell to build the hilarious tension in the book. From beginning to end, readers will be on the edge of their seats wondering what will come through the door next! This one should be great for the elementary classroom or library…and naturally makes an excellent gift for your own little Penelope’s upcoming preposterous birthday party. It’s the third in the award-winning “Penelope” series of books, which include, Penelope and the Monsters (Lobster Press, 2005), and, Penelope and the Humongous Burp (Lobster Press, 2004) Click on the icon to order. UPDATE: I worked as a remedial teacher in an after-school program in 2011, and I read this book to a rambunctious group of first-graders. Each time I got to a part where the door bell went “ding-dong,” the children made so much noise that the principal peeked in our window to see if they were fighting. As we neared the end of the story, the children could barely stay in their seats, they were so excited to see who was coming through the door next. The principal could not understand how one book got the children so animated and involved, so she finally stood to the side and listened as I finished the story. I’m happy to say that she awarded me a “Best Remedial Reading Teacher” gift card of $25. Afterward, I used the book as a story-starter and devised a wonderful creative writing lesson entitled “My Best Birthday Party Ever.” I listed vocabulary on the board (some from the book, some from the grade-level standards), then the children wrote and illustrated their own story. Their reward for finishing this writing exercise was being allowed to read it aloud for the class. The principal was there for that event, too, and agreed with me that Penelope and the Preposterous Birthday Party is not only a good book, it’s a great educational tool. Thanks for writing this book, Sheri. Can’t wait for the next one.